Co-deposition of materials is an important adjunct to thin film materials research and production. Clusters of multiple TORUS sputter sources (cathodes) mounted on a single flange are ideal for these applications. 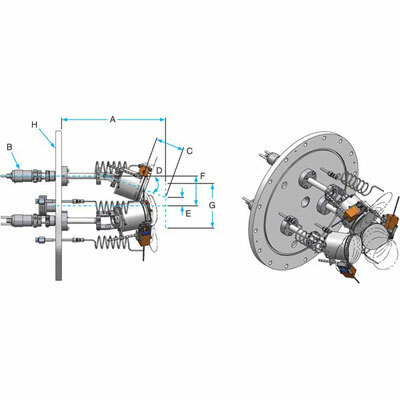 TORUS cluster sources are available with optional cross-contamination shields, integral target gas injection ports, individual source shutters, and a variety of flange mounting options. For applications requiring simultaneous depositions on large substrates, provisions should be made to the deposition system for substrate rotation to ensure uniform film thickness and alloy composition, or during non-rotating depositions a planned compositional gradient can be created. NOTE: LTE and HTE Clusters sources are also available. Please contact us for more information.